Classic Italian carbonara gets a Mexican makeover to create an amazing, out-of-this-world meal. 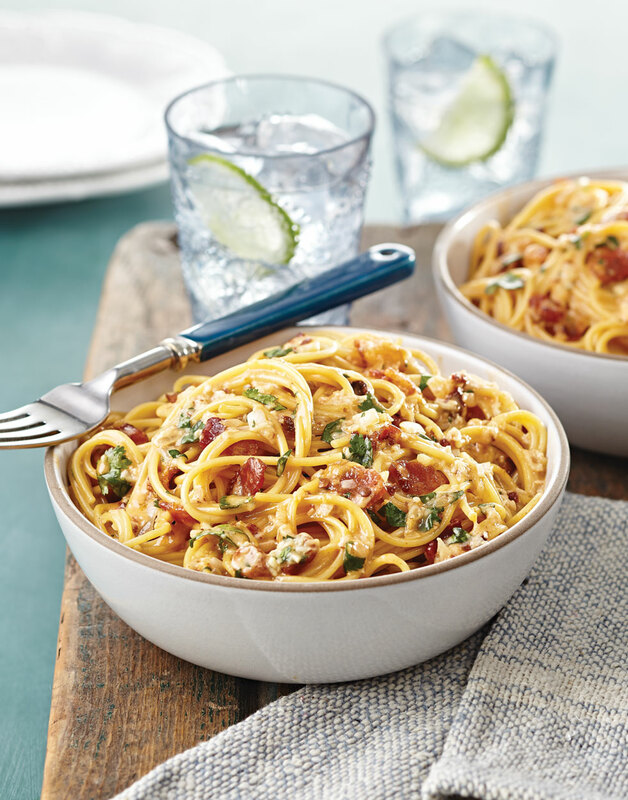 This Chipotle Carbonara has everything you love about the traditional dish with a cheesy, creamy, and spicy Mexican twist. Residual heat cooks the eggs, but work quickly to prevent them from scrambling, and be sure to start with room temperature eggs. Cook spaghetti in a pot of boiling salted water according to package directions; reserve ¼ cup pasta water, then drain. Whisk together eggs, queso fresco, cream, adobo sauce, and chipotle. Cook bacon in a sauté pan until crisp. Transfer bacon to a paper-towel-lined plate; pour off all but 2 Tbsp. drippings. Cook onion and garlic in drippings over medium-low heat until onion begins to soften, 2–3 minutes. Add spaghetti and toss to coat. Off heat, immediately add egg mixture to spaghetti, while stirring quickly, until eggs cook and sauce thickens. Add reserved pasta water, as necessary, until sauce reaches desired consistency. Stir in cilantro and bacon; season pasta with salt and pepper. Finely shredding the queso fresco makes it easy to melt into the sauce. A box grater is the perfect tool. Adding the adobo sauce to the egg mixture ensures it will get distributed evenly into the dish. To prevent the eggs from curdling, add the egg mixture to the hot spaghetti off heat, stirring often.